There was a time when Polaroid was synonymous with the instant pictures. Nowadays, all digital cameras give you an instant view of your picture, so it’s fitting that Polaroid makes point-and-shoot digital cameras. While Polaroid’s t1031 doesn’t print a picture right after it’s been shot, this 10-megapixel camera will give you better results than you’d have gotten with an inexpensive Polaroid film camera. The t1031 is not a bad camera if you’ve never used a digital camera, or if you use your mobile phone for snapshots. The t1031’s small, boxy design fits easily into a pocket, thanks to a lens that retracts flush with the camera’s body. The t1031 feels sturdy and solid, but the lack of any kind of moldings or grips makes it difficult to get a firm hold on. With its smooth finish, you might feel more secure using the camera two-handed. The large 3-inch LCD is very nice; you usually see smaller LCDs on cameras at this price. The LCD suffers a little from streaking when you’re shooting in bright light, but overall image quality on the screen is very good. 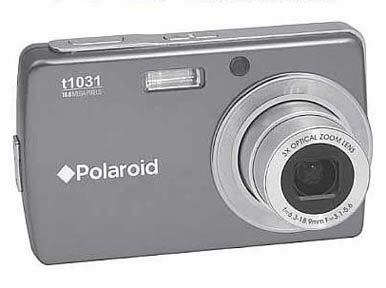 Polaroid includes a proprietary rechargeable battery that helps keep the camera’s weight down. Most cameras at this price use AA batteries that are heavier than the t1031’s battery. But that means you’ll have to carry the t1031’s battery recharger on trips. Autoshooting with the t1031 works well. Since that’s typically how you use a snapshot camera, we were pleased to see that autofocus was fast and accurate, and metering was generally good. At times, the Polaroid has a tendency to overexpose, causing a loss of detail in highlight areas, but overall, it performed well in day and night shooting. The t1031 includes a face-detection feature that locates and focuses faces in a scene. This is a great tool for snapshot shooters, and it makes self-portraits much easier. What doesn’t work so well is the t1031’s smile detection, which attempts to identify the moment when a subject smiles. As is true with other cameras, smile detection is a gimmicky feature that doesn’t work well. Because there will be times when the camera’s auto mode can’t expose your scene perfectly, the t1031 also offers scene modes, which adjust the camera’s meter for specific shooting situations. The t1031 offers a large assortment of scene modes; so many, in fact, that it can be difficult to determine how some of them might differ from each other. For example, unless you take the time to figure out exactly what the difference is between Night Scene, Night, and Candlelight, you may find these modes confusing. Surprisingly, the t1031 offers full manual controls, as well as aperture and shutter priority. This is a startling addition to a $100 camera, and is great for the shooter who’s getting started and wants some room to grow and experiment. Like other cameras in this market, this model provides exposure compensation, for the user who wants a little more control. Unfortunately, you must make mode changes using a menu rather than a dedicated dial, which makes switching slow. You can press the Function button on the back of the camera to get a menu of the last six modes you used, which makes changing modes easier, but I still prefer a dedicated dial. Ultimately, you should buy a camera based on how good its pictures look, and the t1031 yields good snapshot results. As mentioned earlier, it has a tendency to overexpose, but with a little practice you can learn to compensate for this problem by using the exposure-compensation control. The t1031 doesn’t have a great lens, and this shows in the chunky details and mottled colors. The camera also has a bit of a color cast. However, if you’re just looking at images on a computer screen or printing out 4-by-6 prints, these issues won’t have a significant impact. The t1031 can record 640-by-480-pixel video with sound; there’s also an HD-resolution video mode that shoots 1,920-by-1,080 video with sound. The fact that you can get HD video from a $100 camera is pretty amazing, but the t1031’s video quality is hobbled by its low-quality lens. Also, the sound stops recording if you zoom while shooting a video, so you’ll want to refrain from zooming if sound is important. If you currently shoot pictures and video with a mobile phone, then the t1031 will be a big step forward in image quality. Its overall design is well-implemented, and it’s certainly not lacking for features. However, for about the same price, you can get better image quality from the Canon PowerShot A470.